Extreame Savings Item! Free Shipping Included! 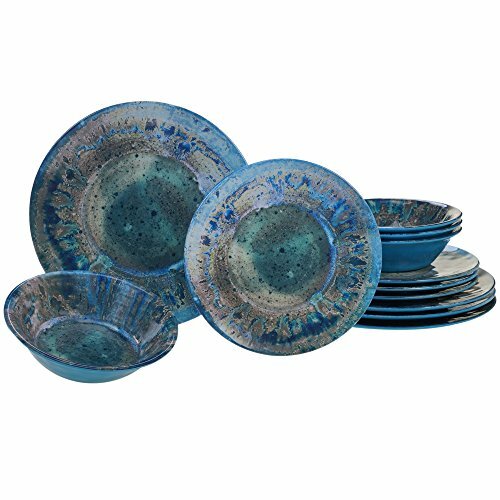 Save 42% on the Certified International Radiance Teal Melamine 12 pc Dinnerware Set by Certified International at Foom App. MPN: 89460RM. Hurry! Limited time offer. Offer valid only while supplies last. Enjoy the unique reactive look of certified international's'' radiance'' heavyweight 100% melamine dinnerware and serveware designed by Daniel D.
Enjoy the unique reactive look of certified international's" radiance" heavyweight 100% melamine dinnerware and serveware designed by Daniel D. Sanchez in 3 rich colors: Teal, Red and cream. Recreated in melamine from one of a kind ceramic glazed pieces, these sturdy yet elegant items are an exciting alternative to solid Color melamine. Layer with patterns or select your favorite Color for year round indoor and outdoor dining.